The murals were impressive, their placement equally baffling as they are effectively not seen. However, the climate of the area is always enchanting. In my original photo there were no buildings nestled behind the billboards on either side in the upper quadrants, only white space that needed to be filled, perhaps with additional buildings. Necessity, the mother of invention. 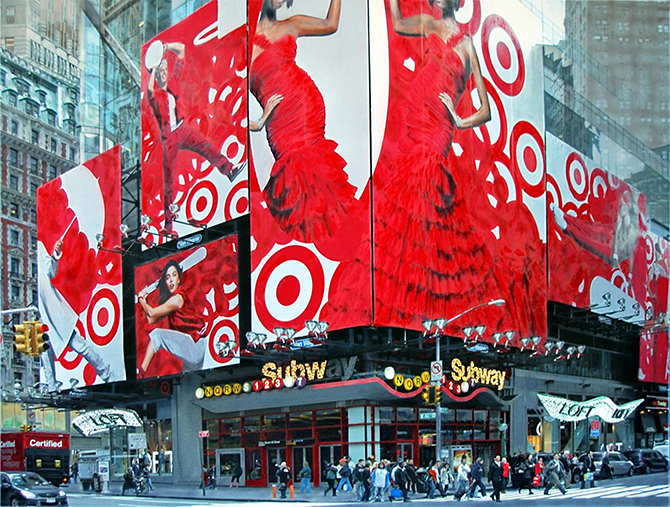 "Denis Peterson distinguished hyperrealism from photorealism making meticulous changes to a work's depth of field, color and composition in order to emphasize a socially conscious message about contemporary culture."